Independence Day is more than just a summer holiday. 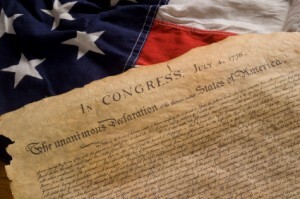 As we enjoy the backyard barbeques, July Fourth bargains, and firework displays this week, let’s keep in mind what the Declaration of Independence is all about. Without the signatures of 56 brave and patriotic men, this country wouldn’t exist, nor would all the good this country has done for mankind over its 236 years of existence. Because of the Declaration of Independence, citizens of this country have been able to pursue “happiness” as they define it. For some it means the opportunity to invent some great new gadget. For others, it’s the opportunity to live their dream to inspire through freedom-of-expression. For some of us it is simply the opportunity to raise a family in peace, prosperity, and security. Because of the Declaration of Independence, along with The Constitution, this country embraces freedom of expression. People can express their viewpoints through speech and art. America invented open political debate without the fear of retaliation from the government. Where would the world of sports be without America. No baseball. No football. No X Games! Americans can also take credit (or blame) for Rock & Roll, Country music, Hip Hop, and Hollywood. For 236 years, we have opened up our gates to the “tired, the poor, the huddled masses” from all over the world. Millions of people have escaped political, religious, and economic oppression to find the freedom of opportunity in America. It is this “melting pot” that makes this country unique to the rest of the world. None of the above would be possible without those 56 signatures on the Declaration of Independence. They stuck it to the most powerful man in the world, King George, and by doing so, became an example for the rest of the world. As you are enjoying those hot dogs and that second slice of watermelon this week, don’t forget to thank our Founding Fathers for securing our Rights to Life, Liberty, and the Pursuit of Happiness.